The Report on Indian Urban Infrastructure and Services (HPEC) estimates Rs 39.2 lakh crores of urban infrastructure expenditure over the next 20 years (exclusive of the land acquisition expenditure). Further, the operations and maintenance expenditure is estimated at Rs 19.9 lakh crores. 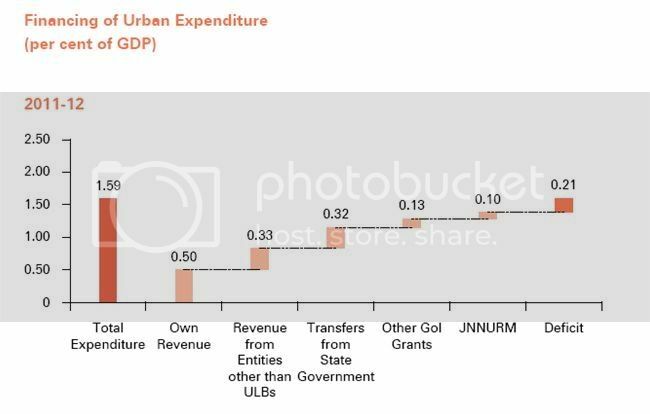 The urban expenditure so far has been financed significantly out of the budgetary support. 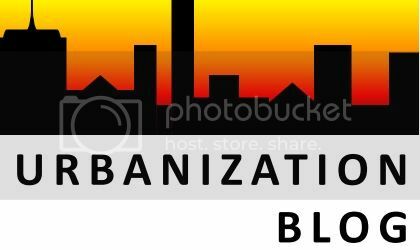 However, going forward, it is envisaged that increasingly the financing needs will be met by Urban local body (ULB) own revenues and the external financing needs through debt financing. There is a strong case for the development of municipal bond markets. There is also significant potential for the development of bond markets in India. The savings rate in India is high, close to 33%. The household savings are roughly 25%, of which only about 50% are currently invested in financial assets. Moreover, over 10% of household savings are invested in gold or currency. An integrated set of actions is required to convert gold/currency based saving into financial saving. The development of municipal bond markets in India has been slow due to constraints that operate on both the demand and supply side. Weak Balance sheets: Strengthening ULB balance sheets is the first step towards developing robust bond markets. The Urban local bodies depend largely on the transfers from government. 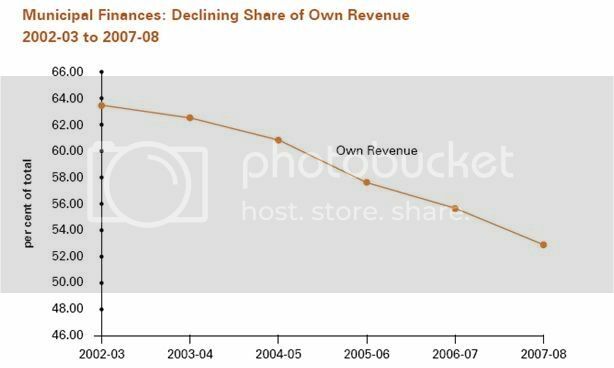 In fact, over the years, the share of own revenue in total ULB revenues has declined. HPEC Report has outlined a host of measures to strengthen the own revenues of India’s local bodies. These include a) Empowering ULBs to levy exclusive taxes, including, and perhaps most importantly property tax b) A more broad based revenue sharing by states with ULBs c) Formula based devolution of state revenues based on recommendations of State Finance Commissions. User charges must also be stepped up to cover operation and maintenance costs. Benchmark and yield curve discovery: Some of the biggest and richest municipal corporations run a surplus and therefore do not need to access the debt market.2 Mumbai’s BMC, New Delhi Municipal Corporation, or various other big corporations rely on loans or grants.3 Consequently, there are no benchmark securities that may guide the investors regarding the associated risk premiums and against which the smaller municipal corporations may borrow. The above can be particularly an issue in a bad year. Nagpur Municipal Corporation (NMC) accessed the debt market in 2007 in order to raise Rs 128 crores. The yield cap was 7.9% (mandatorily required by the Ministry of Finance for tax-free bonds). However at this rate, the issue was undersubscribed and NMC raised only 17% of the intended amount. Credit Enhancement: Institutional investors (e.g. Pension Funds, Insurance) are stipulated to not invest in bonds below a certain credit rating. This calls for specialized credit enhancement institutions (e.g. credit insurers). Measures to enhance disclosures on behalf of borrowers and market infrastructure to enhance secondary market liquidity etc. need to be taken. This is an excellent post touching upon the opportunities and concerns facing the municipal bond market. It may be helpful to study the evolution of municipal bond markets in comparable economies. A bankruptcy attorney long island would probably say that this is a kind of "quiet-before-the-storm" scenario unless the deficits are, at the least, reduced. very good..i can see much stuffed article here..Have to gather information about municipal bond market reports it will help me a lot..Thank you..